Finally, A Perfect Carry-On Bag! The latest innovations in luggage have all been technology based, with charging stations, built in scales and tracking systems being just a few of the innovations driving new products. But the classic qualities that make for a great carry-on bag, things like a rugged exterior, or really good spinner wheels that allow you to either pull the bag behind you or roll it alongside easily, are still important along with the ability, based on it’s size, to function as a checked bag. Finally there comes a perfect carry-on bag that checks all these classic boxes. The Riley Sympatico International Carry-on Spinner with expansion-compression technology. 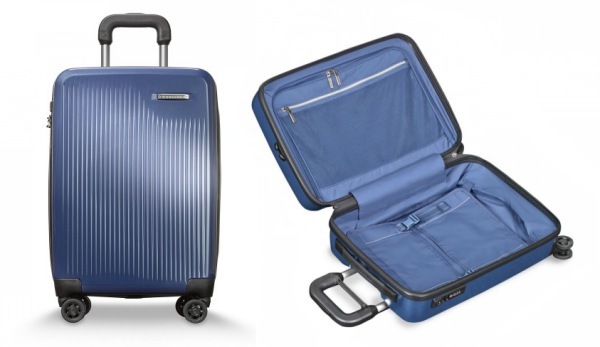 Price and Where to Buy: This hard-sided carry-on bag retails for $529 from the manufacturer; at the time of publication, it’s on sale for $423 on Amazon in both Burgundy and Marine Blue options. Usefulness: 10/10. This sturdy lightweight carry-on suitcase would be a star simply for its smooth 360-degree maneuverability, attractive design, combo lock security with TSA key access, and nearly indestructible hard shell exterior. But it has a secret super power that puts it into rarified territory: expansion-compression technology. Its unique CX “expansion-compression system” allows you to increase storage capacity by 22 percent and then compress the suitcase back down to its standard 9x14x21-inch size, which meets carry-on requirements for most domestic and international carriers. In practical terms, this system allows you to either pack more into your carry-on bag from the outset of your trip, or save extra room for souvenirs and other purchases during your return travels, without having to check a larger bag. Value: 9/10. Although its MSR price of $529 is hefty, you’re paying for a durable high-quality bag that’s more than meets the eye. If you travel frequently, you’ll make up the cost of the bag in no time with the airline bag fees you avoid. Portability: 10/10. Most carry-ons these days conform to standard airline size requirements and can boast some degree of lightweight portability. What’s attractive about the Sympatico, though, is its low center of gravity and 360-degree maneuverability. This is a carry-on bag that won’t topple over and won’t fight back while you’re rolling through the airport. The Briggs and Riley Sympatico International Carry-on Spinner looks like a carry-on but acts like a full-fledged checked bag. Its impressive compression system is a game changer for hard-sided carry-on bags, and its smooth 360-degree maneuverability puts it at the top of the list for portability, too.